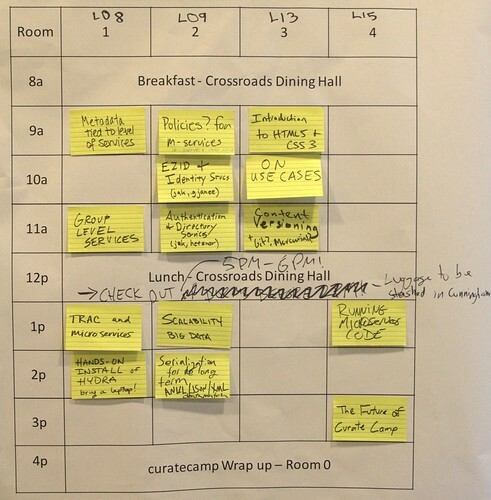 CURATEcamp has been run two different ways: As an unconference and as an OpenAgenda meeting. 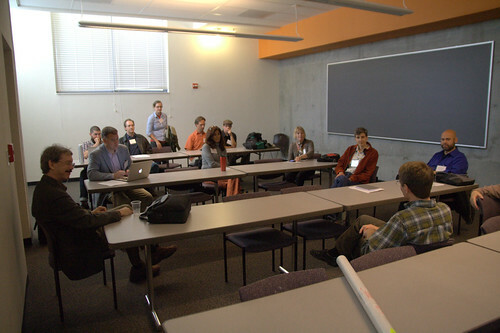 CURATEcamp can be run as an unconference, also known as a user-generated conference or a BarCamp. There are no spectators at CURATEcamp, only participants. 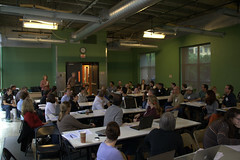 All attendees are expected to give a demo, present a talk, drive a discussion, or participate in a panel or roundtable. It's not as scary as it might sound, though. Sessions at CURATEcamp are conversations, just like every conversation you've had (or wanted to have) at any other conference. The only difference is that the sessions are planned on the spot, which means we're sure to be talking about topics we find interesting. On-site registration works a lot like any other conference; you'll pick up your badge, and agenda at the front desk. Name badges are important at CURATEcamp. Other attendees are here to meet you, and you're here to meet them. Your badge will have your name on it (natch), but we'll give you tools to customize your badge to better reflect who you are. CURATEcamp has many sessions going on at the same time. The only way to keep up with them all is the session grid, a giant board with all the available sessions listed on it. The session grid starts out empty at the beginning of CURATEcamp; only breaks and Ignite sessions (see below) are scheduled beforehand. Sessions are proposed by writing a synopsis on a post-it and sticking it in one of the slots on the grid. The grid fills up quickly over the course of the morning, but it grows and changes as the day goes on and more ideas surface. A session can take a few different formats: a presentation with Q&A, a demo, a panel of experts, or a roundtable. Some of the most interesting sessions are proposed as open-ended questions. ("How would a RESTian BAG server work? ", "How can librarians and IT work more collaboratively? ", "How do we archive and display email collections?, "Working with Big Data", "What's Hydra all about?") Project demonstrations make great sessions, too, especially when they're hands-on. There will be at least one session about CURATEcamp itself, to talk about what we can do better, both on the spot and for the next CURATEcamp. You're more than welcome to start other sessions about CURATEcamp, especially if you think there's something wrong. There are lots of sessions going on at once, so there's no excuse to be bored. More specifically: if you find yourself neither contributing nor learning, it's your responsibility to get up and find (or create) a place where you can contribute or learn. If no one is asking the question you want answered, write it up as a roundtable discussion. If no one seems to share your interest in MODS ontologies, start a session and see who attends. If all else fails, go get a snack and listen in on the conversations there. Food is important. BarCampers (and CURATEcamp'pers?) 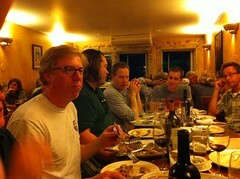 are like hobbits when it comes to food and drink. There will be plenty of it, and it'll be available at all times. Our breakfasts start early, our lunches are long, our dinners are raucous, and there are plenty of snacks to be had in-between. One thing we ask, though: if you find yourself having a fascinating conversation over snacks or drinks, think about adding that topic to the session grid so other people can join in. If you found it exciting enough to talk around a sandwich, there's bound to be someone else who wishes they could join in. This may sound like a lot to take in, but you'll get used to it in no time at all. There will be plenty of unconference veterans on hand to help out, and we'll have a whole group of volunteers to help keep things moving smoothly. If you don't have time to prepare anything before you go to CURATEcamp, don't worry. Just be there in time for the opening session and you'll have plenty to do and contribute. If you want to prepare a talk beforehand. write it up as a set of notes or questions instead of a formal PowerPoint presentation. Do bring props, posters, diagrams, or demonstration equipment if you have it; just don't assume that there will be audiovisual equipment to use. If you've read this far, you're practically a CURATEcamp veteran already. We hope to see you there! If you're interested in organizing a CURATEcamp in your own city, contact us and we'll do what we can to help you get started. CURATEcamp can follow the “open agenda” model. The meeting has no preset agenda on purpose; the point is to connect folks who are eager to share their perspectives and hear those of others. The Camp’s overarching theme is digital curation. We intend for the event to be equally interesting to diverse practitioners, whether you develop software, manage day-to-day operation of a repository, curate digital materials, or are just curious. We sit in a roughly circular configuration, introduce ourselves, and say a few words about the kind of work we do and what we'd like to discuss. The meeting organizer then asks for proposed topics, recording them for future reference, and then we'll chunk the discussions into 30 minute slots. At the end of each 30 minute slot, we vote on continuing the current topic or moving to the next one. People are encouraged to add topics to the list during breaks and lunch. Late in the afternoon, we begin wrapping up the discussion. After the event, try to keep everyone together for drinks or dinner so you can discuss what you've heard and network with peers!